Order the Paperback on Amazon.com Click on the book image and it will take you to the Amazon Page for ordering. $16.99 with Free shipping with Amazon Prime. "This book, like many of Ron's, I find that I keep within easy reach, year in and year out!" "Loving Yourself: Your human self has within it all of the attributes of the Divine. By learning to heal your self-criticism, and by your willingness to love your human self, you can directly experience the Divine within you." "You know those days when you are feeling down and kinda saying to yourself - why am I here and what is it about life. Well here is the truth. Ron Scolastico speaks the truth through the Guides - channeling the most kind, compassionate, loving words that will snap you back into that knowing that keeps us all trying and being. Buy it, open it to any page when you are feeling small - you will expand into your spiritual best- I promise." "This is a book I keep by my bedside. Each morning I open to a "reminder" that will guide my day. Brilliant!" 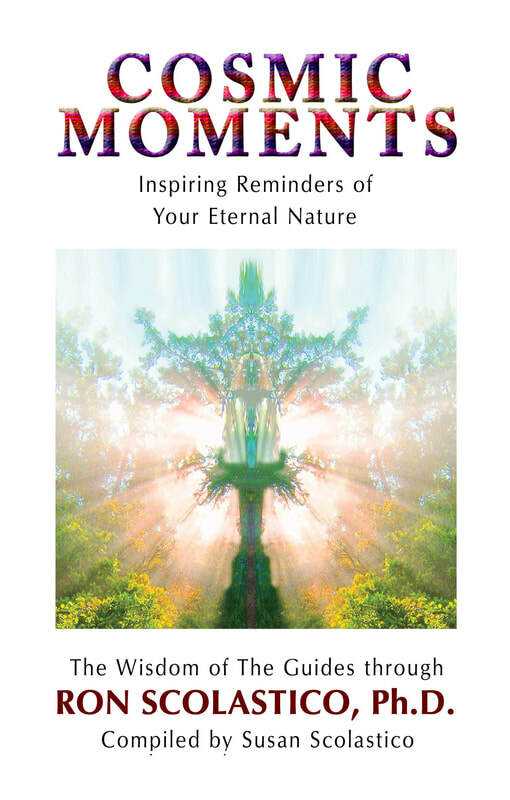 Cosmic Moments is a collection of powerful spiritual metaphysical statements, and affirmations compiled by Ron and Susan Scolastico from the Wisdom of the Guides. This wisdom will help you create brief moments of spiritual awakening on a daily basis. In time, those inspired moments can become profound experiences of personal enlightenment. Dr. Scolastico calls the daily inspirational statements reminders. He explains, "Within each of us, hidden beneath our conscious awareness there is already an intuitive knowing of the spiritual truths of life. We simply need to be reminded of those truths so that they can be brought forward to become part of our conscious awareness." This is a book that you will want by your side every day. You can turn to it whenever you need inspiration and it will help you remember who you truly are: a magnificent, spiritual being who is temporarily living in human form. In Cosmic Moments, Dr. Ron Scolastico, a spiritual psychologist with more than 40 years of counseling experience writes, "No matter what a person's life situation might be, no matter how busy his or her days are, it is possible for anyone to learn to create brief moments of spiritual awakening on a daily basis. Over time, those inspired moments can add up to poweful experiences of personal enlightenment."